Designation for one type of wine with a pale, light red color. The color may range from salmon (light red) to cherry red (dark) depending on the intensity of the contact with the skins. The name Rosé is according to EU Regulation Reserved wines, which were pressed exclusively from red wine grapes. A blend or a Cuvée of different red wines is allowed. Which as red wine varieties or as Quality wine-grape varieties apply, state the countries themselves, possibly also the colour and the alcohol content, A rosé is only for Vins and quality wines with indication of vine and vintage allowed. But there are also some white wine varieties with red berry peel such as red Muscat (variety Muscat Blanc ) Gewurztraminer (Red Traminer) or Pinot gris, as well as in South America Cereza and other Criolla varieties that give a more or less reddish wine. However, wines from such white wines are not considered rosé in the EU. In June 2009, following strong protests from some wine-growing associations, a bill was rejected by the responsible EU Commission, which would have allowed rosé wine to be produced simply by blending red wine and white wine. This was intended to remove the competitive disadvantage vis-à-vis the off-EU blending of red and white wines for the purpose of producing the simplest rosé wines. So a blend of red and white is only for the lowest quality level Wine allowed. For the Slovenian PTP wine cviček but a special arrangement was obtained. As another exception is also in the production of sparkling wine a blending allowed. In the wine types popular in Germany Badish rose gold. Rotling. Squint and Schillerwein White and red wine grapes or their mashes are blended or processed. These may not be designated as rosé in accordance with the provisions. In some wine-growing regions, red wine with a corresponding derogation also permits white wine grapes, for example Châteauneuf-du-Pape and Côte Rôtie in France as well Chianti in Italy. The grapes are using so-called mixed fermentation fermented together. But this is not a rosé wine. 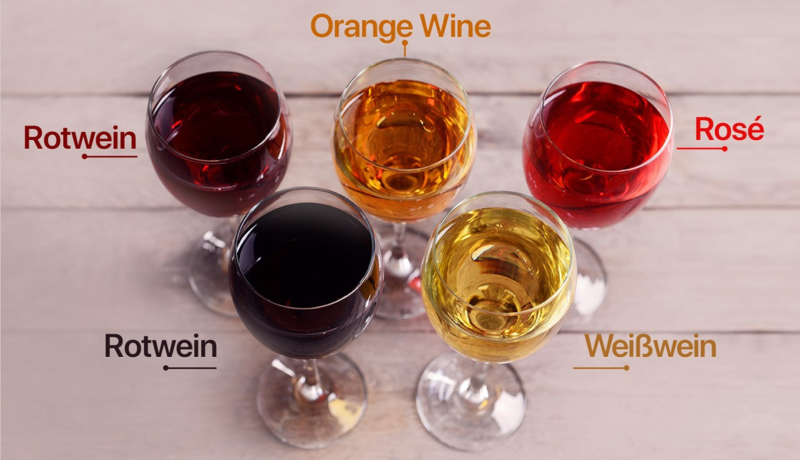 This also applies to the type of wine which has become very popular in recent years Orange wine (Natural Wine, Raw Wine), which usually has a yellowish red (orange) color. 1) In the most common method, the dark grapes are treated exactly as if they were white. On the way through the Traubenmühle will the grape Although slightly stained by the colors of the berry shells; However, unlike red wine, there are none maceration (do not leave it on the mash). After this Press The reddish must is then processed like a white wine. This results in very bright rosé wines. 2) In the second method, the grapes are pressed only after a two to three-day mash period and then processed the grape must, which usually results in much darker and more intense flavor rosé wines. 3) The third method is the so-called "bleeding", French saignée, The grapes are squeezed but not pressed. However, before the must can assume a darker red, a part is already deducted after 12 to 48 hours or simply won by "draining". The rest of the must is processed as red wine, which is more concentrated and stronger in color by this process. The rosé is a byproduct. 4) In a fourth method, a red wine goes through beautiful (mainly by medium as PVPP and activated carbon ) freed of tannins and thereby lightened. 5) When as Blanc de noirs designated wine ("white from black") is a wine made from red wine grapes bright, which is particularly in the champagne or. sparkling wine Application finds. He may have bright (white), but also a slightly reddish color; in a slightly darker color it is called Taché. In Germany, "Blanc de noirs" as a complementary name in the Weißherbst be used. In German and Austrian wine law, the name / production is not explicitly defined. Rosé wines have a long tradition, especially in France. The production share in 2010 was 12% (red wines 45%). In many appellations for red wines also rosé wines are included. This is especially true of the regions Bordeaux with the Bordeaux Rosé and the darker pressed Bordeaux Clairet. Loire with the rosé main area Anjou. Languedoc-Roussillon. Provence and Rhone to. The Tavel from the southern rhône area Tavel is called "king of the rose wines". Two very successful Markenroséweine from Portugal Lancers and the in Bocksbeutel bottles bottled Mateus rosé, In Italy, there are three rosé wines classified with the highest grade DOCG, that is Alta Langa (Piedmont), Franciacorta and Oltrepò Pavese Metodo Classico (both Lombardy). In Austria and Germany rose wines from the 1980s as light summer wines popular; the production share is relatively low. In Argentina, huge quantities become qualitatively much easier, rosé-like Schank wines or. mass wines from different red berries Criolla varieties generated. Here, as well as in Chile and in the US, there are also many EU legally compliant rosé wines. This page was last modified at 11 April 2019 at 16:07.